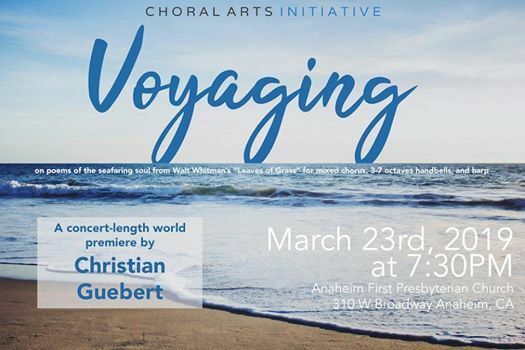 Choral Arts Initiative Concert "Voyaging"
Featuring the world premiere of Voyaging: on poems of the seafaring soul from Walt Whitman's 'Leaves of Grass' for chamber choir, harp, and handbell ensemble by PREMIERE|Project Festival alumnus Christian Guebert. 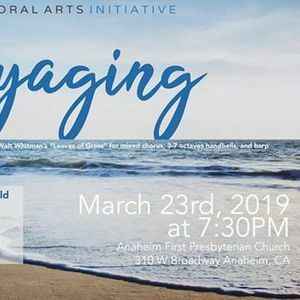 Propelled by Walt Whitman's transcendent poetry of the "unbounded sea," this choral song cycle sets the lifelong journey of the universal Voyager, sailing forth from land with both mortal body and limitless soul aboard the ship. Harp and handbells form a narrative world of joy, loss, death, and love through which the music navigates. Come join us for this vast, expansive, and sonic listening experience!